This long holiday weekend, the celebrations in honor of San Vicente Ferrer competed for my attention against beautiful, hot, sunny weather. The weather won. I spent the weekend alternating between the beach, the terrace and the park. The sounds of the celebrations occasionally found my ears, until I flipped over and fell back asleep. So, no religious awakening this weekend, but I did get a mild sunburn. 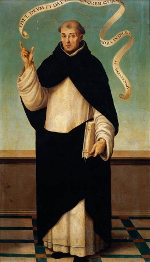 This fiesta is in honor of Valencia’s patron saint, San Vincente Ferrer. Flowers have been brought to the cathedral, and recreations of Ferrer’s miracles are taking place on makeshift altars around the city, including the Plaza de Tossal and Ruzafa. Orphans perform re-enactments of the saint’s most legendary achievements. Even if you don’t speak a word of Valencian, these are fun — the kids really give it their all. Did you get to enjoy any of the festival, or were you also distracted by the great weather? By the time Ferrer comes around, after Fallas and Semana Santa, it’s hard to get back up for another city-wide party.